Just two rum lovers sitting behind a microphone chatting about nothing special. Like many visits to your favorite bar you probably don't plan your conversation ahead of time. That is exactly what we did this episode of ZTL podcast. 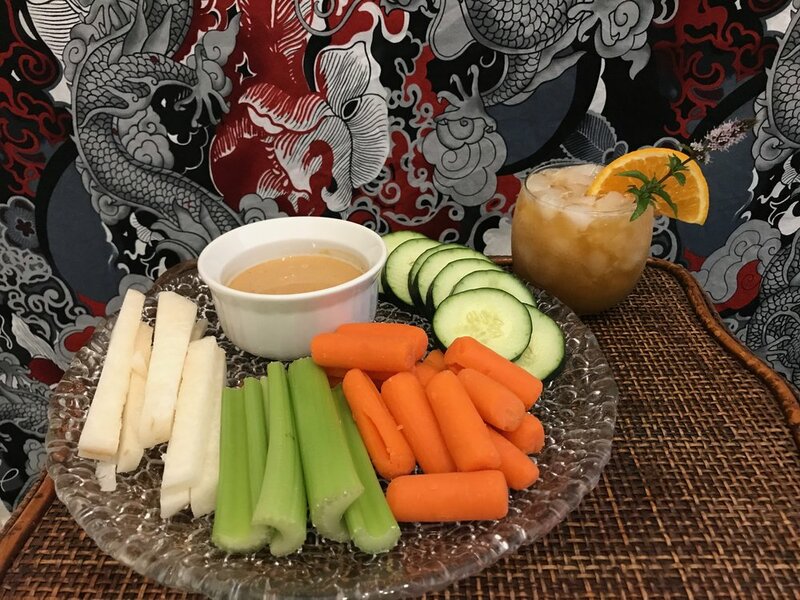 Sunshine and Starshine enjoy Chinese Sandman along with veggies and a nice peanut dipping sauce. We wanted to keep our mood (and yours) very light in respect to recent events around the world. Even the music is designed to set a zen feeling of relaxation. Stir all ingredients together until a thin sauce is formed. Stir long enough to remove any lumps. You can add more peanut powder if it is too thin or more water if it is too thick. Use this sauce for a dip or dressing. Also a great chicken marinade or add to stir fry. Sunshine and Starshine are wearing shirts from Tiki Bar T-Shirt Club in the above picture. We love the soft cotton in both mens and women's sizes. Each month a new tiki bar design that always gets people asking "where did you get that shirt". We LOVE Tiki Bar T-Shirt Club.